Leawo iOS Data Recovery for Mac is one of the best iPod touch, iPad and iPhone data recovery software for Mac. The software helps users to recover lost files from iOS devices and iTunes backups with no efforts. This iPad/iPod/iPhone data recovery software also helps users to backup iPhone, iPad and iPod touch to Mac computer. Recover 12 kinds of lost files from iTunes backups for all iOS devices. Recover 6 kinds of lost files from iOS devices, and recover 6 kinds of lost files from iPhone 4 and iPod touch 4 under DFU mode. Fully support the latest Mac OS X 10.9 and the latest version of iTunes. Fully support iOS 8 and the latest iOS devices. Enable users to save the lost files to Mac computer. Get lost data back caused by different reasons, like device damage or system crash, etc. Run fast and stable, and have friendly UI. This iPad/iPod/iPhone data recovery software for Mac helps users to recover 6 kinds of files directly from iOS devices, including Contacts, Messages (MMS, SMS, iMessages), Call history, Calendar, Notes and Reminders; and helps users to recover 6 kinds of lost files from iPhone 4 and iPod touch 4 under DFU mode, including Contacts, Messages (MMS, SMS, iMessages), Call History, Calendar, Notes and Reminders. Leawo iOS Data Recovery enables users to recover 12 kinds of files from iTunes backup for all supported iOS devices, including Camera Roll, Photo Stream, Photo Library, Contacts, Messages (MMS, SMS, iMessages), Message Attachments, Voice Memos, Call History, Calendar, Notes, Reminders and Safari Bookmarks. This iPad/iPod/iPhone data recovery software supports all kinds of iOS devices, including iPhone 6, iPhone 6 Plus, iPhone 5s, iPhone 5c, iPhone 5, iPhone 4s, iPhone 4 and iPhone 3GS; iPad Air, iPad 4, iPad 3, iPad 2, iPad 1, iPad mini and iPad mini 2; iPod touch 5 and iPod touch 4. Leawo iOS Data Recovery for Mac works well with the latest Mac OS X 10.9; fully supports the latest version of iTunes; runs smoothly with the iOS 8. This iPhone data recovery software for Mac can recover the lost files of various formats, and export them with no effort. The software can recover and export images (.jpg, .jpeg, .png, .bmp, .tif, .tiff, .gif); videos (.mov); voice memos (.m4a). The software can recover and export the contacts to CSV, VCF and HTML files; export messages/iMessages/call history/reminders/calendar/notes/Safari bookmarks to HTML files. Leawo iOS Data Recovery for Mac helps users to recover the lost data caused by various kinds of reasons. For example, the files are erased while syncing with iTunes; the files get lost when upgrading the iOS or restoring the iDevice to factory settings; the files are gone when the iDevice is lost or broken. Users are able to take advantage of this iPad, iPod touch and iPhone data recovery software for Mac to get the lost files back. Leawo iOS Data Recovery for Mac has a “Smart Filter” function. Users are able to find the files they want to recover by typing the (full) name of the file in the searching column. The iPhone data recovery software for Mac also sorts out the files by name and date to help users find the target files within seconds. 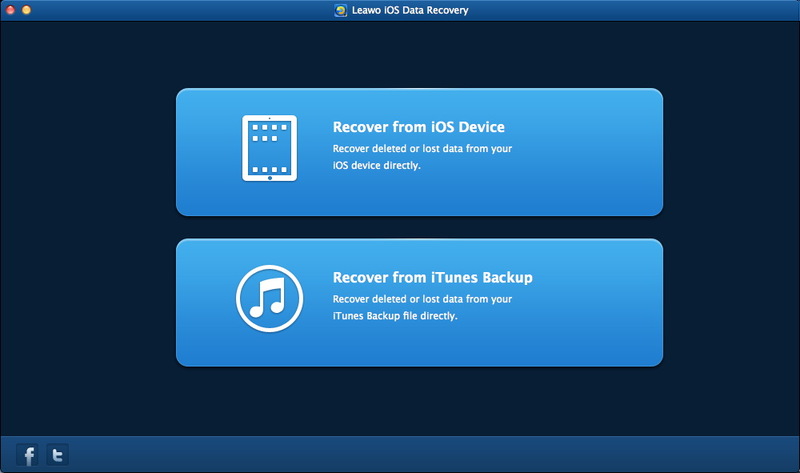 Leawo iOS Data Recovery for Mac has a friendly UI and is easy for users to handle. Users only need to take few simple steps to accomplish the recovery. The preview function of this iPhone data recovery software for Mac enables users to view the files in categories, and it will be easy for users to choose the files they want to recover. Recover lost or deleted files from your Mac hard drive and storage devices. Clean up iTunes music library, add song tags and remove duplicates.